U.S. Coast Guard officers assist passengers Wednesday on a dock by Dempster Street Beach. Local safety forces responded after receiving a call that three individuals had fallen into the water once two boats collided. Local safety forces rescued three individuals in the water off Dempster Street Beach on Wednesday after receiving a call that two sailboats had overturned. 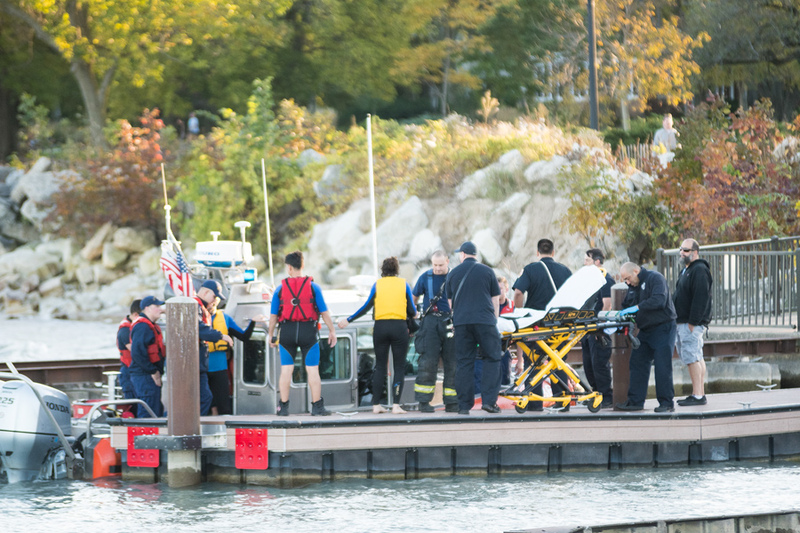 Evanston Fire Department officers, U.S. Coast Guard officers and an Evanston lifeguard responded to the incident, which occurred just before 5 p.m., city manager Wally Bobkiewicz told The Daily in an email. Bobkiewicz said the two sailboats had collided, sending the individuals on board into the water. EFD could not be reached for comment. Evanston police Cmdr. Joseph Dugan said he heard on the radio that two of the individuals were windsurfers. Petty Officer Second Class Ryan Ortega — who is based at Wilmette Harbor’s U.S. Coast Guard station — said as of Wednesday evening, the Coast Guard is unable to provide any identifying information for the passengers. Ortega said Coast Guard officers assisted two individuals and an “Evanston lifeguard boat” assisted the third. The passengers were brought on shore and treated for mild hypothermia by emergency medical services officers, he said. Bobkiewicz said one of the individuals was transported to a hospital in the area with “believed nonlife-threatening injuries.” The other two passengers declined to comment. Paul Nierman (Kellogg ’76) said he was walking along the lakefront when he spotted the sailboats. Nierman said within the span of about 20 minutes, safety forces had arrived and rescued the three passengers. Evanston resident Deborah Horwitz, who also witnessed the incident, said the passengers were wearing life jackets. She commended the quick response from officials.